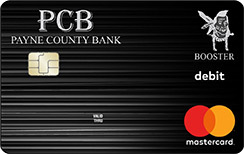 Get your Payne County Bank Booster Debit Card Today! Upgrade to the Booster Debit Card for free and support your local school today! Payne County Bank is pleased to offer you a way to support our area schools: Perkins-Tryon, Ripley and Agra. PCB will donate 5¢ to your school's activity fund for every signature transaction. It doesn't cost you anything! PCB's quarterly Booster Bucks payments will offer each school the flexibility to provide extra support to programs at their discretion. Important: Transactions using a PIN (personal identification number) do not count toward the fundraiser. So be sure to swipe your card and sign your name as a credit transaction. Exchange your current PCB debit card for a new Booster Bucks debit card FREE of charge! Complete the form and indicate which card you prefer - it's that easy. Note: You will receive a new card within a few days; your current debit card will continue to be available until you activate the new Booster Bucks card. Call the bank 547-2436 or stop by the Main Bank at 202 S. Main, Perkins. Payne County Bank has helped many generations of families build their homes, educate their children, grow their businesses, and enjoy their retirement years. This is the lifeblood of communities. Because of this, we have pledged $1 million in scholarships to area schools through the Payne County Bank Community Bankers Scholarship Program. We recognize that education is the foundation for encouraging and supporting economic growth to develop communities. The strength of a sound, independent, employee owned and operated community bank means a strong commitment to you, our loyal customers and the community in which you live. We thank you for placing your trust in us for over 100 years! 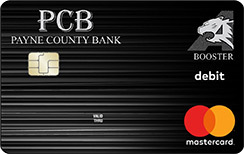 How did you hear about PCB Booster Debit Cards?